Genetic evidence reveals that the Mavers are most likely descendants of the early Celtic inhabitants of the British Isles. The little that is known about these early British inhabitants comes from archaeology, linguistics and a few written accounts of Roman contact with British tribes. 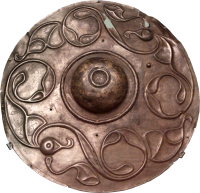 The time period of early Celtic Britain corresponds with the Iron Age; roughly 500 BC to 100 AD. There is still some academic debate about whether the Celts invaded Britain, displacing its earlier inhabitants, or if the Celtic language and culture of the European continent was adopted by the indigenous population. There is hope that further genetic study will help determine the origin of the British Celts. The archaeological record indicates that there was a close cultural connection between the Celts of Britain and the Gaulish Celts of modern-day Germany and France. Metal artifacts and decorated stonework of this era echo the continental La Tène style, with highly stylized animals and sweeping curves. Most archaeological finds from this era are from southern Britain, but the remains of settlements and hillforts found both in northern and southern Britain suggest cultural similarities throughout the isle. Linguistic evidence persists in place names, with towns and rivers that still retain their Celtic-language roots. It is thought that all of the Celtic inhabitants of Britain originally spoke Brittonic, a branch of Celtic languages that arose in Britain and survives today in the Welsh language. The language, as well as the Isle of Britain, is named for what the Celts called themselves: the Pritani. The Romans Latinized this as Brittani, and called the island Brittania. In modern Welsh, the island is still called Prydain, reflecting the original name of the Isle and its people. As with the archaeological evidence, the linguistic evidence suggests a connection between all of the early Celtic inhabitants of the Isle of Britain--a culture that the Maver ancestors were a part of. Genetic evidence makes it clear that the Maver family has a Celtic origin, so it is unlikely that Mavers are descended from the Romans, the Normans, the Vikings or any of the later groups who came to Britain. 1: Mavers tested so far have been found to be in a genetic haplogroup associated with the Celts. The Roman and Norman armies certainly had Celtic troops, so it is not impossible that our ancestors were a part of these invading groups, but they would have still been Celtic. See the DNA Project page for more information.